Looking at the list of things to do in Crete is quite daunting, once you get over pages and pages of ancient Minoan settlements and the endless array of beaches you are left with things like the cave of Zeus and the Lasithi plateau – a flat plane at an altitude of just under 2000m covered in windmills and used predominantly for agriculture – for this trip we thought it would be nice to visit the oldest olive tree on the island. 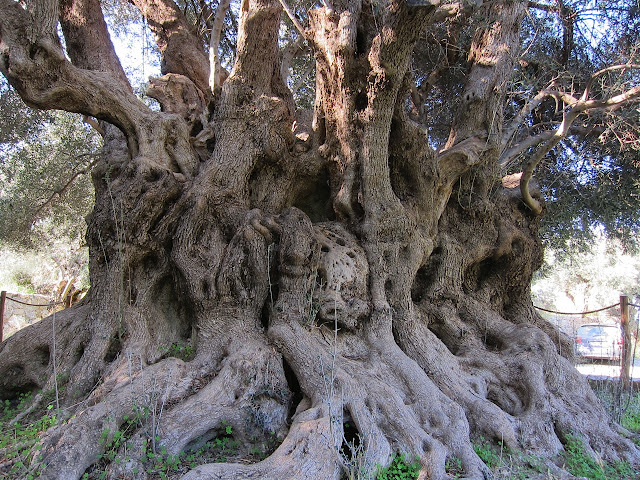 The tree is so old that it predates most modern faiths - Christianity and Islam included! Finding the tree proved to be an interesting experience. First we had to find the village of ‘Kavousi’ between Agios Nikolas and Sitia, then we had to try to find the signs for the tree, but of course we didn’t need the signs … we had three back seat drivers and a front seat one too … we were good! Naturally this meant that we ended up in completely the wrong place! However in doing so we rather accidently found quite a stunning view! Eventually after half an hour of driving along just about every lane there was in the surrounding area we by chance came across a sign. Several signs and quite a few potholes later we found the tree. It was HUGE! I guess if you had been growing for around 3250 years you would also be the size of a house! 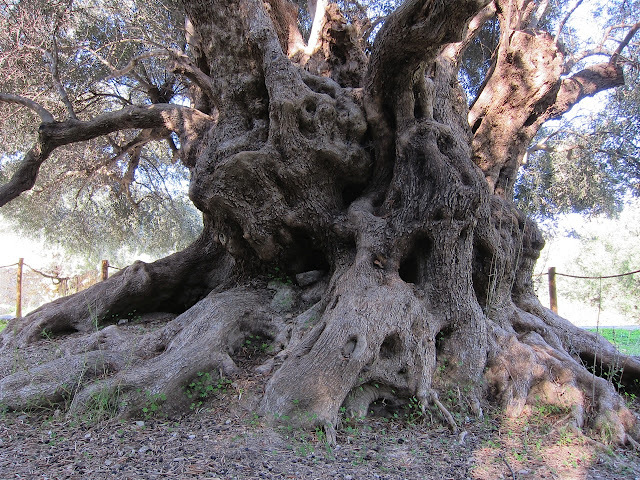 This particular tree is classified as ‘monumental’ by the Association of Cretan Olive Municipalities (SEDIK) and is now officially protected. The trunk is so large that it measures 14.2 meters in circumference and has a diameter officially measured 80cm from the ground of 4.9 meters. The tree is actually a minor celebrity, it gave a few of its young branches to the 2004 Olympic games, they were used to make a wreath which was presented to the female winner of the marathon. Standing at the base of the tree I have to admit to being in awe of it, I thought to myself, imagine the stories that this tree could tell if only it knew how. The tree has survived countless battles, invasions, wars and political crises, perhaps there is hope for us all yet! 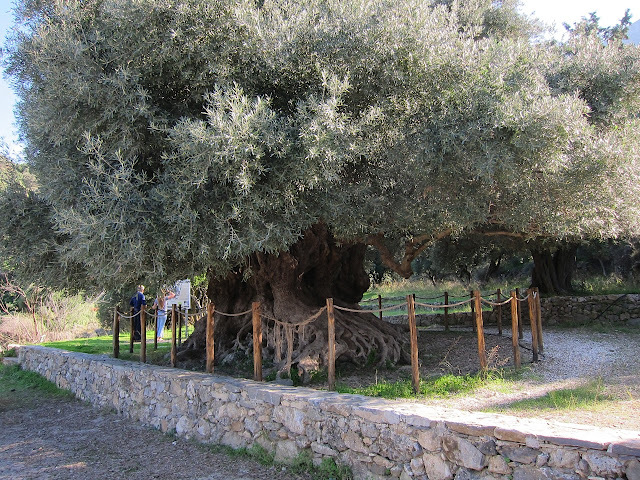 The tree is located just above the village of Kavousi on the Agios Nikolas – Sitia road. Signs on the mountain side of the road will point you to the right turning. While you do not need a 4x4 to get to it I would recommend a car which is slightly higher off the ground as the road is neither tar nor concrete and made for some very careful driving. I live on Crete, the largest of the greek islands. How i got her seems imaterial now. I have decided to document the lives and the way of life of those around me as a way for showing what truly goes on in Greece. Cooking in the eye of the storm! Charity Photo Shoot for the Street Dogs of Sitia. All photographs on this blog are Copyright and may not be used with out my express permission.. Simple theme. Powered by Blogger.